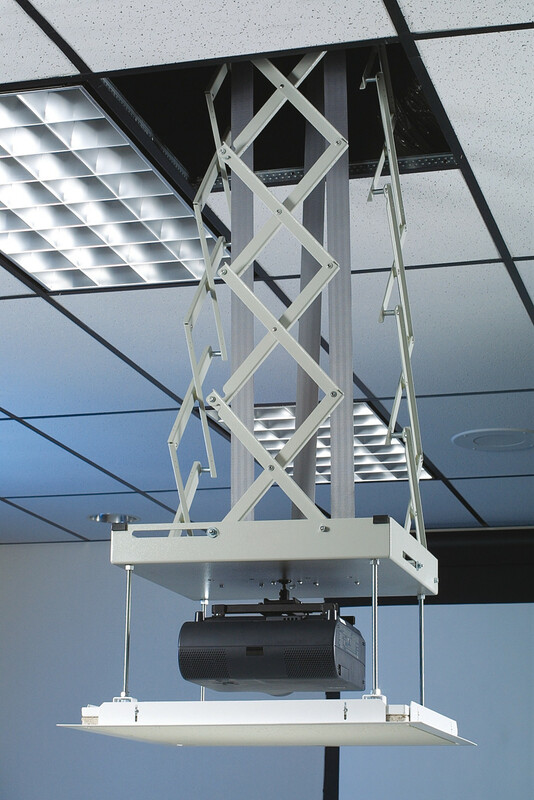 The Cosmo projector lift is compact scissor lift which allows for accurate decent and ascent of the projector, and conceals it above a suspended ceiling when not in use. An exclusive 3-scissor design which features a reliable side-folding scissor stabilizes the projector laterally and front–to–back. Its load is lifted by two strong traps, and a safety belt provides extra protection. With an extension capacity of 120 cm the Cosmo is ideal when lowering the projector below any technical or architectural obstacle. Its “show” position is set at any point with infinite adjustability within its extension. The scissor lift is designed to fit within a 60x60 cm ceiling grid system and both ceiling closure panel and projector mount are supplied as standard with the lift. The Cosmo projector lift has an optional choice of a Cosmo Housing which prevents the projector from theft.